Princess Diana, right, is seen in 1997 wearing one of her trademark jewels: an emerald-cut ring with an aquamarine stone. 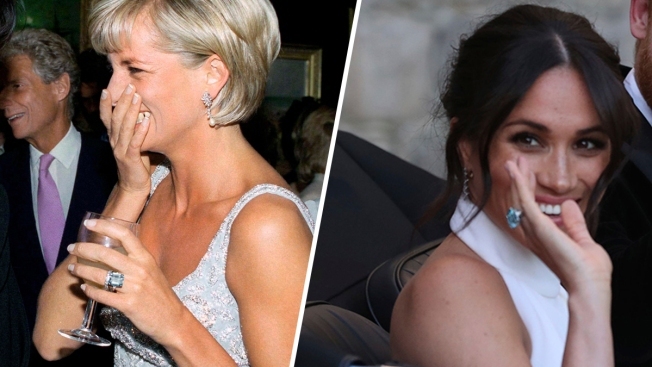 Duchess Meghan, left, is seen wearing the same ring while she and Prince Harry, Diana's son, head to the reception following their wedding. Hours after the former Meghan Markle exchanged vows with Prince Harry at St. George's Chapel in Windsor, England, she emerged for the evening celebrations wearing another very meaningful piece of jewelry: a ring that belonged to Harry's mother, the late Princess Diana. The stunning emerald-cut ring with an aquamarine stone, seen here in 1997, was one of Diana's trademark jewels, Today.com reported. It was yet another sweet way for Prince Harry to honor the memory of his mother in the royal wedding. Earlier during the ceremony, the Duchess of Sussex’s bridal bouquet contained forget-me-nots, which were Diana’s favorite flowers. As announced at the time of the couple's engagement, the duchess's engagement ring also contains two diamonds from Diana’s personal collection.